The cluster hardware is based on combination of nodes with Intel Sandy Bridge 2670, Ivy Bridge 2670v2, and Broadwell 2680v4 CPUs, and 128 GB of RAM per node. 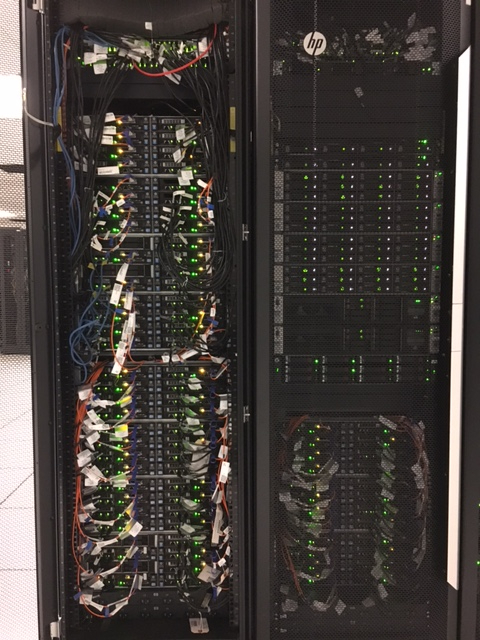 There are 82 nodes in the cluster available for general use. There are also 30 nodes dedicated to several Engineering research groups. The nodes are interconnected over FDR 56Gbit infiniband and Gbit networks. Distributed cluster file system, BeeGFS, is available for parallel multi-node simulations. Each of the two interactive front-end machines have two Nvidia Kepler K20 GPU cards installed on each. The front end hosts and the storage server on the cluster can be accessed via SSH from the RU networks. See the details here. The cluster resources are managed by SLURM queue system. Users will need to submit all their applications through batch scripts to run on the cluster. Here is a reference to the most common SLURM commands. soenode[87-110] Broadwell 2680v4, 28 CPU Cores per node. The environment for the applications, such as path to the binaries and shared libraries as well as the licenses, is loaded/unloaded through the environment modules. For example, to see what the modules are available on the cluster, run command module avail, to load a module, say matlab, run command module load matlab/2017b. More information on using the environment modules can be found at this link. Application for SOE HPC Cluster Account: http://ecs.rutgers.edu/form/soe_hpc_cluster_application (NOTE: Must be on a Rutgers-networked computer/VPN to access! ) Undergraduate and graduate students should have their faculty advisor to send a confirmation e-mail to Alexei about requested computing resources. ACCESS NOTE: The two aforementioned hosts and the application URL are only accessible from WITHIN Rutgers' networks, so you must be logged in on a Rutgers computer physically or remotely via SSH or VPN to access these hosts. © 2011 Rutgers, The State University of New Jersey - This site is XHTML 1.0 valid.